If it were possible, I would give this book 10 stars. I learned sooooo much! I bought the book as a resource for my LDS Church calling, but it is filled with so much wisdom for other leadership aspects of my life, too. I highly recommend this book. “Imagine yourself as a living house. God comes in to rebuild that house. At first, perhaps, you can understand what He is doing. He is getting the drains right and stopping the leaks in the roof and so on; you knew that those jobs needed doing and so you are not surprised. But presently He starts knocking the house about in a way that hurts abominably and does not seem to make any sense. What on earth is He up to? The explanation is that He is building quite a different house from the one you thought of - throwing out a new wing here, putting on an extra floor there, running up towers, making courtyards. You thought you were being made into a decent little cottage: but He is building a palace. He intends to come and live in it Himself.”There are three kinds of members in the church: saints, aint’s complaints. Our challenge, our opportunity, our covenant, is to be saints.Motto: Obedience is the price. Faith is the power. Love is the motive. The spirit is the key. Christ is the reason.In our individual ministries we can choose to be either primarily transactional leaders or transformational leaders. A transactional leader focuses on routines and regimented activities. He invests most of his energy in making sure meetings run on time, that administrative details are properly handled and that completed tasks are noted on check lists. A transformational leader focuses primarily on initiating and managing changes in those he serves. He invests energy in efforts that influence people to improve, to stretch and redefine what’s possible. While the bishop needs both kinds of leaders, it is the transformational leader who is most influential in bringing about the might change in people.The road to holiness necessarily passes through the world of actionGood LDS members is active not passive. Active verbs have power. People who are the happiest, strongest, are those who honor covenants, hold to the rod of the word of God, obey the commandments.Low competence/high commitment: Directing (structure, control, supervise)Some competence/low commitment: Coaching (direct and support)High competence/variable commitment: Supporting (praise, listen and facilitate)High competence/High commitment: Delegating (give responsibility and accountability)There is nothing as unequal as the equal treatment of unequal“We scheduled zone conferences. For each one, Sister Packer baked a three-tiered cake, … decorated beautifully—thick, colorful layers of frosting, trimmed beautifully, and with ‘The Gospel’ inscribed across the top. When the missionaries were assembled, with some ceremony we brought the cake in. It was something to behold!“As we pointed out that the cake represented the gospel, we asked, ‘Who would like to have some?’ There was always a hungry elder who eagerly volunteered. We called him forward and said, ‘We will serve you first.’ I then sank my fingers into the top of the cake and tore out a large piece. I was careful to clench my fist after tearing it out so that the frosting would ooze through my fingers, and then as the elders sat in total disbelief, I threw the piece of cake to the elder, splattering some frosting down the front of his suit. ‘Would anyone else like some cake?’ I inquired. For some reason, there were no takers.“Then we produced a crystal dish, a silver fork, a linen napkin, and a beautiful silver serving knife. With great dignity I carefully cut a slice of the cake from the other side, gently set it on the crystal dish, and asked, ‘Would anyone like a piece of cake?’“The lesson was obvious. It was the same cake in both cases, the same flavor, the same nourishment. The manner of serving either made it inviting, even enticing, or uninviting, even revolting. The cake, we reminded the missionaries, represented the gospel. How were they serving it. "The greatest battles of life are fought out daily in the silent chambers of the soul. This book was awesome!I want to purchase a copy and go to town underlining and making notes. I don't ordinarily like this book but I picked it up out of nowhere and thought it was interesting. I think the books title doesn't do its usefulness justice. It's really a great book for understanding any kind of production environment, from an LDS perspective. there is numerous conversations about interacting with people, setting expectations, fulfilling obligations, dealing with 'failure', and so on. Even though this was yet another 'random grab', I enjoyed reading it. There are quite a few one-line gems in the book that are useful in a variety of situations. "Does the Lord regard your handicap as a reason to forfeit an opportunity to serve? Does he regard your handicap as a reason not to share the gifts you have? Some people say age is a handicap. My grandafther said dealing with age is simply mind over matter. If you don't mind, it doesn't matter." This was more clear and consise than a few "coporate self help books" passed around our work place. Yet "self help" is not the category this book was intended. It is a practical how to get things done yourself and with others.Worth reading again. This book is filled with very good principles and practical advice. I found the ideas to be helpful not only in serving in the church, but also in my role as a mother. What a great book for any leader, especially in the church. I found that I could relate many of these traits to any application of my life, church, work, and family. Within the LDS culture this is a must read on leadership. 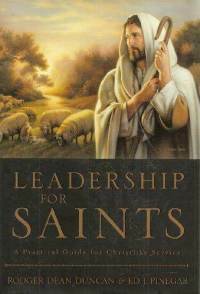 This is a great book about leadership development using the teachings of Jesus Christ as a foundation. This is both useful for LDS and any Christian. Highly practical and recommended! Great resource! Wish I had these leadership ideas many years ago.